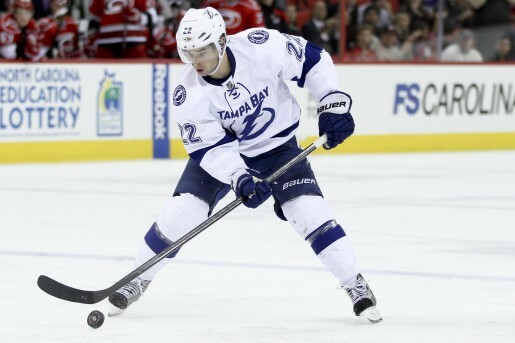 The Replacements – How Have the Lightning’s Call Ups Played This Season? In Monday’s game against the Flyers, the Tampa Bay Lightning suited up four players that had started the season in Norfolk, the Lightning’s AHL affiliate. Throughout out the season 8 members of the Norfolk squad have been called up to fill in for injured or sick players. Some have been up for two or three games and then been sent back down. Others have fought their way onto the roster and have contributed to the Lightning’s season. One of the signs of a strong organization is how these replacements fit in when they’re called up. If there is a noticeable drop-off in play then it’s an indication that there isn’t much depth. Being able to seamlessly replace everyday players is extremely important when the team has lost over 230 man-games due to injury. It also helps keep the payroll down. When players like Mattias Ohlund or Ryan Shannon are lost for an entire season they can be replaced by either an internal player or by a player from an another organization. Trades usually cost a team assets such as draft picks or prospects, and more likely than not, the established veteran coming in will have a higher salary than a farmhand. While General Manager Steve Yzerman did make a couple of trades to shore up holes in his roster, most of his moves were internal. So on an individual level, how did these players do? Also, what is their future with the organization? JT Wyman – 33GP 2G 9A. The former Montreal Canadian farmhand hasn’t been overly splashy on the ice. He tends to play 12-14 minutes of defensive hockey from his forward position. He has the speed necessary to play in Guy Boucher’s system, but hasn’t been able to translate the scoring touch he displayed at the Junior level. As a Restricted Free Agent he should be offered a contract next season and battle for a spot on the fourth line. Most likely he will return to Norfolk and await an injury call up much like he did this season. Dana Tyrell – 26GP 0G 5A. Even before a knee injury ended his season in January it had to be a disappointing season for the 22-year-old Tyrell. Despite being a regular in the lineup last season he was sent to Norfolk to make room for Brett Connolly on the opening day roster. He was eventually called up in November, but failed to find any consistency or offense before being shut down for the season. He should be at full strength by the time next season starts, and with two season’s left on a team-friendly contract ($600,000 cap hit) he should be in the mix for a spot on the third line. With his talent and speed he might even find some time on a top line if he can find his offensive game. Blair Jones – 22GP 2G 2A. The eternal Bolts’ prospect actually played pretty well for the 22 games he was called up for this season. He was dispatched to Calgary for Brendan Mikkelson in January Mr. Yzerman began rebuilding his lackluster defense. Trevor Smith – 14GP 1G 3A. Smith was a scoring machine for the Admirals, he racked up 62 points in 58 games for them in between call ups to the Lightning. With Tampa Bay he hasn’t displayed the same offensive flair, but he has filled in admirably for Nate Thompson as the 4th line defensive center. With his contract expiring at the end of this season it will be interesting to see if the organization brings him back. If another team offers him a chance to make a NHL roster it wouldn’t be surprising to see him go after it since it doesn’t appear there will be an opening for him with the Lightning. PC Labrie – 13GP 0G 2A. “Nacho” is quickly turning into a fan favorite at the Tampa Bay Times forum. A hulking forward who tips the scales at well more than his official listed weight of 218 lbs., Labrie is showing that he can contribute more than the occasional big hit. He has provided the 4th line with a solid fore-checker and responsible defensive forward. His size and willingness to defend his teammates does add a little physicality that the Lightning lack as a whole upfront. He is under contract next season, but chances are he starts the year in Norfolk and gets called up as needed. Mike Angelidis – 6GP 1G 0A. His stats are more indicative of the life of a call-up. His recalls throughout the season were more as a precaution then actual need for a player. Angelidis did make a splash by scoring a goal in his first career NHL game, but since then played sparingly before being sent back down. Most likely the team will let him test the free agent market in the off-season. Evan Oberg – 3GP 0G 0A. Evan Oberg is the Wanderer. He has been called so many times this season the club has posted an official mileage tracker on their website. Oberg is good enough to fill in if needed, but not enough of a prospect that the organization feels they’re hurting his growth by benching him instead of letting him play in the minors. He has acquitted himself alright in the 3 games he did manage to get into, but his future with the club is murky. He is a Restricted Free Agent, but coming off a contract that paid him $1.5 million a year, the Lightning might be willing to let him go or try to re-negotiate for a lower salary. Brandon Segal – 6GP 0G 0A. Since being re-acquired from the Chicago Blackhawks organization Segal has filled the role of depth forward fairly well. He’s played in the last four games and averaged about 7 minutes of ice time. While he hasn’t made much of an impact with the team, he hasn’t hurt them too much either. He probably won’t be back with the organization next year unless he’s willing to accept a 2-way contract for about the same or less than he’s making this year ($525,000). Even if he does he is destined to spend most of the season in Norfolk. At 28-years-old it’s becoming less and less likely that he will be an everyday NHL player. It has been a mixed bag of results for the Lightning call ups this season. Some, like Wyman and Labrie, have played well enough that they could be on the opening day roster next season. Others like Segal, have provided the Lightning with a warm body, but they have not really advanced their career.